So I’m fat. Ok, perhaps “overweight” is the optimal term. Where did that come from? Ok, let’s back up…..
A couple of weeks ago, Dan and Kurt and the guys at Mid-TN Nutrition announced a body transformation contest. A prize to the winner and the winner’s favorite charity. I’m all about encouraging my clients and friends to participate in challenges that promote fitness. Transformation challenges, 5K races (on the road, in the mud…), triathlons, whatever. That’s why we have a dry erase board in front of the rowing machine at the gym – so people can record their times and compete. Motivation is key in reaching any fitness goal. Of course I sign up for the “Transformation Challenge,” because I rarely encourage others to do something I won’t do myself. So there I was, stripped down to my underwear, sitting in the “Bod-Pod,” getting my bodyfat measured. I was idly curious while waiting. I wonder what the magic number will be. Probably not as low as it has been in the past, but I wasn’t really concerned. Finally the machine resembling a time capsule space pod cracks open and releases me back to the public. I walk over to the front desk, wait for the paperwork, and read….TWENTY-FIVE PERCENT!! What? That can’t be right, I need to get my eyes checked. Yet there it is again. Maybe Kurt’s playing a joke on me. I look up…nope. I still cannot believe it. I look down at myself; all of the sudden I feel very self conscious standing there at the front desk in my underwear, which is odd for me. My wife can tell you I usually have the modesty of a lifeguard at a nudist colony. Do you know that dream where you look down and realize that you are naked and in public? Bingo. In shame I walk over, get my picture taken, and put my clothes back on. What just happened? Is this a dream? No. Is the “Bod Pod” wrong? Probably not. I’m sure there’s a margin for error but it can’t be that far off. What just happened? I woke up. That’s what happened. Not from a dream, but from denial. I woke up and realized that I am out of shape. I motivate and push people every day. How did that happen? The same way it happens to anyone else. All of these thoughts hit my head…..How long has this been going on? I’m sure it’s been progressive. Does this diminish my value as a trainer? Good question to challenge myself with, but no. Some of the greatest coaches in NFL history have led their teams to victory long after they were able to effectively run down the field and score themselves. I see people reach goals and change daily. That being said, it doesn’t mean I’m any less disgusted with myself. The reality is….I’ve been in denial. I’m a 38 year old man who just realized that I’m no longer wearing a 25 year old body. Sure, I’ve been plagued with injuries over the past year – torn triceps from a snowboarding fall, a bad case of tennis elbow that kept me from training effectively for several months. But those are just excuses, aren’t they? No, I let it slip up on me. Thank you Mid-TN Nutrition for bringing that to my attention! I suddenly realized that I’m going to take this transformation challenge seriously, starting today. Join me in this journey, the start of which is 12 weeks. I’m going to blog my daily progress, and invite you to follow me, and I challenge you to join me yourself. 9 Comments to "Time to Wake Up!" I think everyone runs into this eventually. You are choosing to do something about it. I have reached goals, lost them, reached them again… Then lost them. I think the issue with most of us is that we let the slip ups prolong our success and reaching our goals. I have been working on the same goal for now 3 years. I just keep letting life trip me up. Gotta stick with it! Congratulations on finally doing something about it and sharing this to motivate the rest. Glad they’ve been successful on getting your attention to do this and get back in shape. I’ve been through this before and it’s really hard to get in shape and keep track of everything you need to do and not to eat. Good luck. Hang in there buddy. Yes, this is really happening to us and we really need to wake up and do something about it before it’s too late. I’m still in the process of waking up but the realization of where we are right now is the most important thing of all so we can plan ahead on what we can do about it. I woke up one day and realized how big I had become. I recently lost 45 pounds and feel so much better. still have some more to lose but I’m soo happy with what I have accomplished! Looking forward to your updates! Well done on the weight loss! Keep up the fitness journey. I’d been on the same situation where in I realized that I’m no longer looking fit and good. Healthy and active lifestyle is calling my name but I don’t know how to start. Foods with high-calories are always making may days and hobbies are really hard to forget. I hope one day, one very special day, I will wake up with enthusiasm and perseverance to do something in decreasing my weight. I’m pretty much in the same boat as you. I’m 35 and a little out of shape. It ‘s becoming a little difficult to stay fit when you’re dealing with slower metabolism, junk food craving, and less active lifestyle. Finding out that I’m heavier and chunkier was enough for me to commit to a fitness and diet regimen. 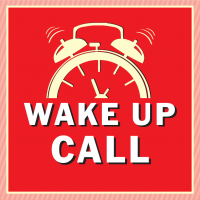 You’re right, we all need our little wake up call.